Alexis loves lollipops. 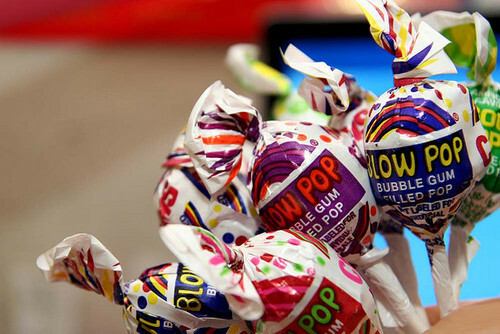 It doesn't really matter what kind - cheap old Dum Dums or Tootsie Roll Pops. Our grocery store of choice conveniently has their candy section right next to the taco supplies. When we were there to pick up ingredients for enchiladas last week, Alexis grabbed a bag of lollipops and asked if we could get them. I said yes without really looking at them. Turns out they were the bubble gum filled Blow Pops. Later that night, after supper, we let her have one with instructions not to eat the pink stuff in the middle. I was waiting on her to finish the sucker so she could have a bath and kept checking in on her progress. When I started to be able to see the gum through the shell, I committed one of my biggest parenting fails to date. Me: *mentally kicking myself* Did you already eat some? What followed next can only be described as a full-on meltdown that lasted off and on for the next two hours, until bedtime. I later learned that she had not slept during naptime at school, so that explains some of it, but ever since my grievous error Alexis has been randomly saying things like "I don't like bubblegum," although thankfully we haven't had another meltdown over bubble gum being stuck in her tummy. Now I've got a dozen or so lollipops to eat myself.